↑ "About BIS". 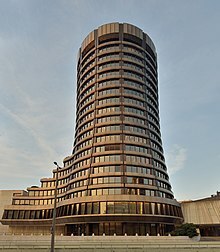 www.bis.org. 2005-01-01. Retrieved 2016-03-17. ↑ "About BIS". Web page of Bank for International Settlements. Archived from the original on 14 May 2008. Retrieved May 17, 2008. ↑ "About the BIS – overview". www.bis.org. 1 January 2005. ↑ BIS History – Overview. BIS website. Retrieved 2011-02-13.